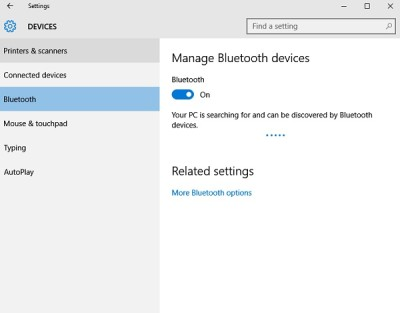 Learn how to enable Bluetooth in your Windows 10 PC. If Bluetooth is not working in your laptop, you can find fixes for common problems and turn on your Bluetooth connection. Bluetooth is a popular wireless technology that transmits data back and forth between devices over a short distance. A Bluetooth device uses radio waves instead of wires or cables to connect to a phone or computer. In most devices Bluetooth is disabled by default. You must enable the Bluetooth to start connecting to nearby devices. 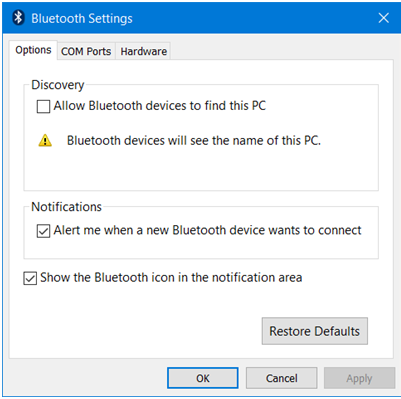 In this article we will walk you through the simple steps of enabling the Bluetooth on Windows 10 computer. Click Search box on taskbar, type “settings” and press enter, from the results list select Settings. Click Devices to open the panel with the list of available devices as displayed below. To enable Bluetooth, toggle the Bluetooth slider to the On position. 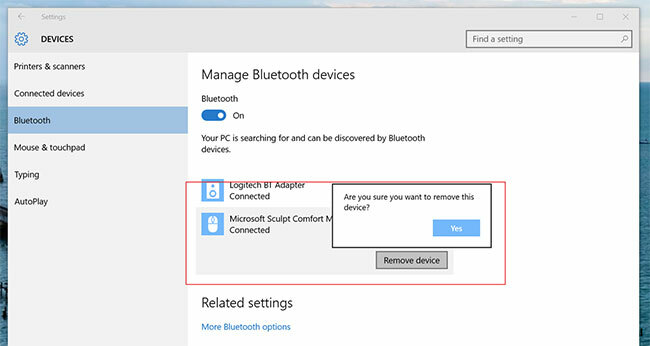 After enabling Bluetooth, your computer will automatically start scanning and list the Bluetooth enabled devices found. Click on the device name to expand and view the Pair option as displayed in the illustration above. Select the device you want to connect and click Pair. Before connecting, you will be prompted to confirm that the passcode is the same on both the devices. Click Yes to confirm and connect both the devices via Bluetooth. After the connection is made you will notice the “Connected” label under the device name. You can click on More Bluetooth options to display a new window with the Bluetooth device settings as shown in the following image. You can also add the Bluetooth icon in your system tray to receive an alert for every connected device. After connecting the devices, you can use the Bluetooth connection to send or receive data. Select the device to disconnect, and click the Remove device button and click Yes to confirm. Click the Start button, and go to Device Manager to verify if the driver is present and installed correctly. This happens sometimes when your computer’s Bluetooth hardware requires a special driver which is not available with Windows. In such a case, you will find the appropriate driver either in the driver CD that came along with your computer or on the computer manufacturer’s website. You can go to manufacturer’s website to download the Bluetooth driver and install it in your computer. 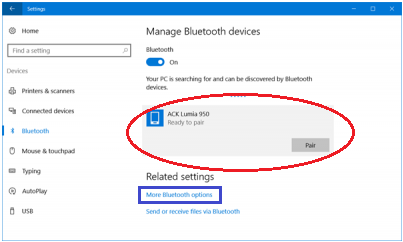 Last updated: 22 September 2017 | Published on: 6 February 2017 | Authored and Edited by: Lalit Kumar and Team | Filed as: Home » Microsoft » Windows » How to Enable Bluetooth in Windows 10?